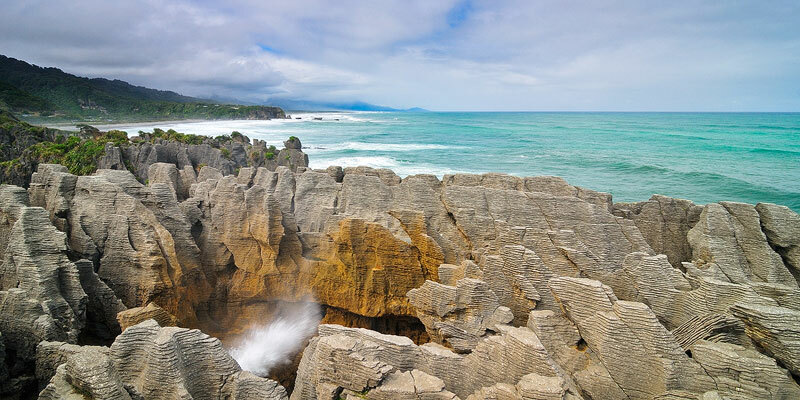 Our next destination was the Pancake Rocks and Blowholes at Dolomite Point near the town of Punakaiki, New Zealand. We left Cape Foulwind early enough so I would have plenty of time to explore, look for compositions, and find out where the sun was going to set. After a short walk we reached the main blowhole viewing point. I set up my camera, including my remote cable release, and waited for a few minutes for an ocean swell. My timing was way off on the first spray. But I was ready for the next one. I captured this photo below at the height of the eruption. I was hoping for a lot more height, but the ocean didn’t want to cooperate with me that afternoon. Luckily, the swells were supposed to get bigger near sunset. I took a few more shots, and then explored the area a little more. I decided to crop the image slightly, as I think a 1:2 aspect ratio works a little better. “Blowhole at Punakaiki” Punakaiki, New Zealand. We spent the rest of the afternoon caving and feeding ourselves, along with the wekas hanging out at our campervan. Before I knew it, the sun was starting to get low on the horizon so we headed back to the viewpoint. I had picked my composition earlier in the day, as I used “The Photographer’s Ephemeris” again to find out where the position of the sun would be as it hit the horizon. I took a few test shots, and then waited for a wave to come crashing in. Thankfully, the forecast was right and we were treated to some slightly larger sprays and some beautiful evening light. “Pancake Rocks Sunset” Punakaiki, New Zealand. 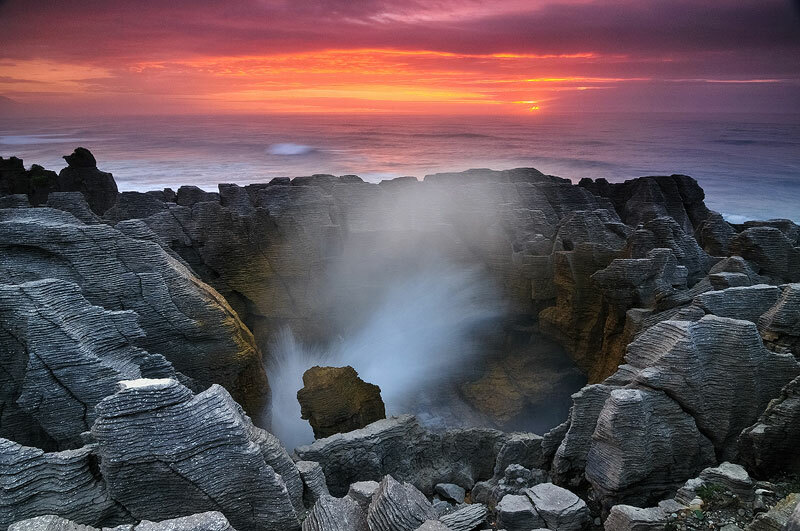 Written by Mike Isaak, posted on November 7, 2011 at 7:00 am, in New Zealand and tagged new zealand, pancake rocks, punakaiki, sunset, travel photography. Permalink. RSS feed for this post. « Archway Islands Sunrise – Wharariki Beach, New Zealand.